For the boys, I’ve been using the program Handwriting Without Tears. It’s an American system for teaching handwriting and I feel it is great. A lovely sister bought the book for me all the way from the US when R was little but by the time it arrived R was already able to write. But now alhamdulillah it can be used for the boys. Let me run you through how it works. .. 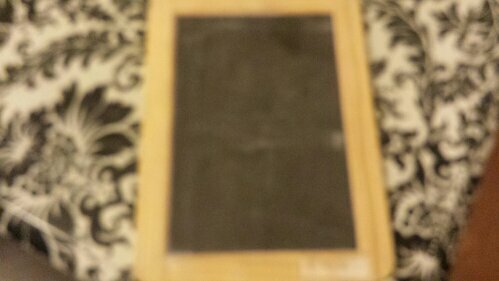 So I can use it for the remaining 3 children who will be learning how to write, I photocopy the pages. 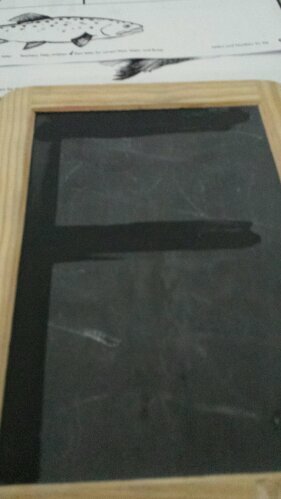 The lesson starts off with me showing the boys how to write the letter on a small chalkboard. 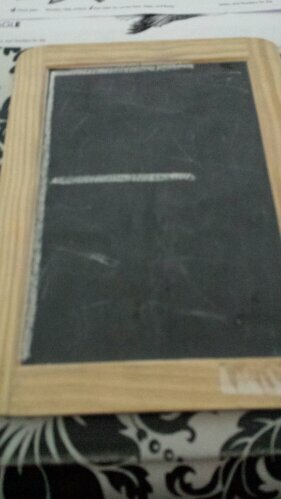 I was given these tiny chalkboards and they are perfect size for this program. 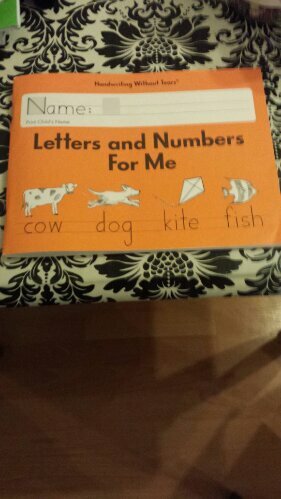 It is important that they see each step of writing the letters in the specific order. Next, I wipe off the letter in a wet sponge in the same procedure of writing the letter. It has to be in the same order. So the shape of the letter is still visible on the board because of the water. After this with a dry cloth, I then dry the letter. .. again ensuring I’m drying it in the correct order of forming the letter. After this the boys then do it with their boards and chalk, sponges and dry cloths. And then I give them a sheet from the book to complete independently. Above Y is completing his sheet. What is great in my opinion about this method is the repetition of chalk, wet sponge and dry cloth. The child sees the method of writing the letter three times. 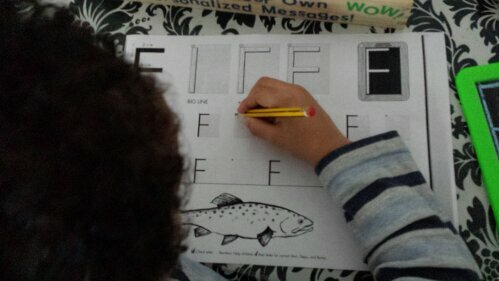 The size of the board is crucial and is great because the child uses the board edges as margins for the letters. It is very difficult for small children to form letters freely on a page. And so drawing the necessary lines along the edges of the board helps them control each letter or number. Handwriting Without Tears includes lessons for uppercase and lowercase letters aswell as numbers. We do a page a day whenever we do English. MashaAllah I can honestly say it has been really good for the boys. Oh and I found the app on the ipad so sometimes they can supplement it with that. Hope this helps anyone looking for a handwriting program for their children. This review is soooo long overdue subhanaAllah. Jzk to all those sisters I mentioned it to briefly and who patiently waited for me to post this post. Those of you who have been reading the blog will know that a huge part of R’s formal studying is Arabic. Alhamdulillah, by Allah’s grace she is fluent in spoken Arabic mashaAllah. She speaks Derja (Algerian dialect – with typical Algerian body language an’ all lol) and fusha Arabic. She can read and understand and also writes. She does Arabic with her father twice a week and is currently working through the Madinah Arabic books – currently working through the second book. In these lessons with her father, she does A LOT of writing, grammar, spelling, and dictation. After he’s gone through a grammar lesson with her, he sets her a lot of work and sometimes it takes up pretty much the whole day not to R’s liking but she has to do it! This is something that I feel is compulsory for her and no unschooling element to it allowed! In addition to this, we started her on the Studio Arabiya trial a few months ago. It was a 2 week trial but I felt that it was so good that I decided to pay the monthly fee. 1. R loves her teacher, Sister Reem, who I feel is just great mashaAllah. I hope Studio Arabiya give her a rise in her pay as she really is fantastic mashaAllah. 2. The entire lesson is in Arabic with no English at all (I assume they have different options for those who are just starting out with the Arabic language). 3. For me, the ABSOLUTE plus side is that for 30 mins 5 days a week, R gets to practice speaking. Her written and reading skills she can practice in her lessons with her father. She does speak to her father in Arabic as he has forbidden her to speak to him in English but I wanted her to speak as much as possible with others. In these lessons, she hears and speaks Arabic with her teacher whilst learning reading skills, grammar and vocabulary for 30 mins each day. Our basic price is $79 per month for the standard, which includes 10 hours of one-on-one time with the teacher. If a student wants the intensive (20 hours per month) or to take both Arabic and Qur’an, the monthly tuition is $139. We offer a family discount of 10% off for families of 2 or more students. Everyone that signs up automatically gets the first week free. This way they can try out the classes risk-free to see how it works. We did try the Quran tuition at Studio Arabiya but R didn’t like it and I didn’t think it was worth it as her father is a Quran teacher. But for those that are looking for that, then they provide that option too. Although, my husband says that Quran needs to be taught in the more traditional way with a teacher face to face. Each to their own opinion I guess. I would thoroughly recommend the Arabic program at Studio Arabiya. I’ve seen a huge difference in R’s confidence in speaking to someone else other than relatives in Arabic and the staff really take the parent’s opinons and choice into consideration. Ie. some of the work was too easy for R so I asked them to push her which is just what the teacher did mashaAllah. Very professional mashaAllah and definitely a thumbs up from me. When I said R hated the workbooks, I haven’t gone back to them at all. And so I am trying to find alternative ways for her to work on her writing but in a fun way. She still emails her friends mashaAllah which is good but I really want her to learn her grammar, spelling etc through writing and just writing freely. We have done a lot of creative writing. But I’m trying to include different forms. It is an old issue mashaAllah but she really got into it. What I liked about it was that it is sooo child friendly, colourful, fun and the children really do learn about their deen. R learnt about the 3 types of hajj and we talked at length about Zamzam. Within this particular issue was an activity which encouraged the children to write a newspaper report! When I saw this, I thought brilliant mashaAllah – just what I need! She didn’t feel like doing it as she wanted to carry on reading it but its definitely something I’ll keep inshaAllah for later. Whilst she was reading, I thought it would be great for her to write a review. After she finished, she wrote a review about the magazine for the aunties who read this blog. I corrected the piece for spelling mistakes and grammar. She then spent some time doing some ICT and typed up her report. The review is very simple 🙂 But I’m trying to bring in writing for different purposes and so I hope to expand on review writing the next time she does a review inshaAllah. Anyway, back to the actual magazine. I would really recommend buying a subscription of Little Explorers. The excitement of receiving their own copy of a magazine addressed to them is priceless. 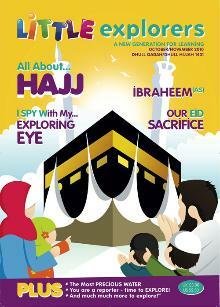 And the magazine itself is top quality, no faces, full of colour, great activities and very engaging. What was nice for me to see was a good balance of easy to read language but also challenging words at the same time, an educational type activity linked to what they had read, something fun and she really enjoyed the comic strip at the end mashaAllah. 10/10 for us alhamdulillah! Visit http://www.littleexplorersmagazine.co.uk/ today and invest in a subscription for your kiddos!